The HUDY Engine Break-In Bench is the ultimate tool for easy, safe, and professional break-in of your .12/.15/.21 engine. Allows for a controlled break-in process that reduces wear & tear on engine components and increases performance, reliability, and longevity. Constructed of top-quality components of tough aluminium and spring steel, the Break-In Bench comes partially assembled from the factory to get you running sooner. Thick aluminum base plate with integrated clamps allows quick, solid mounting on any workbench. Large protective propeller shroud safely covers the included prop. Includes pre assembled throttle linkage, universal engine mounts, large-capacity 125cc fuel tank, prop spinner, and all necessary hardware. Requires use of an electric drill (not included) to spin the prop. Break in your engine like the pros! Great tool which is invaluable for nitro racers who break in a few engines each season. It cuts so much of the required track time and wear and tear on the car when breaking in engines. I've also found that the engines broke in on the break in bench generally last longer and run smoother with lower temperatures, better idling, holds tune better and has more power than engines broken in on track. It's very well made and will last years if looked after. For the price I believe the bench pays for itself after just a few engines! Buy it you won't be sorry. I had own this product for almost three year it has finish breakin six of my nitro engine on and off road from .12 to .21. And now I have a few more nitro to breakin especially the one from murnan. As you may read the review from other user I don't have to say much about this product. It is super Great product to have if you are running nitro. I understand there is lots of different way of breaking in the nitro but I found this way with the Hudy bench is much more easier, and way more control to how you want to perform the breakin process. 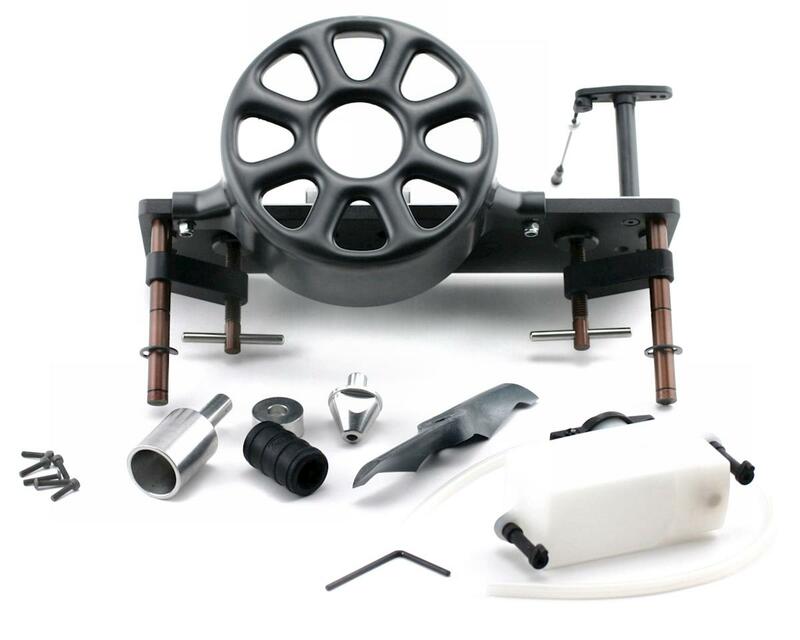 Super nice tool to have, fits almost all sizes of engines and comes with everything you will need. Make sure to get a on road header for you pipe as the U shaped off road ones do not work with this break in stand. excellent built & materials used, not to mention the ease of use for beginners like myself. very easy to assemble with detailed instructions. will purchase another in the near future or an upgraded model if hudy makes one. WELL DONE HUDY! i give this break-in bench a 2 thumbs up and 2 big toes up(way up). 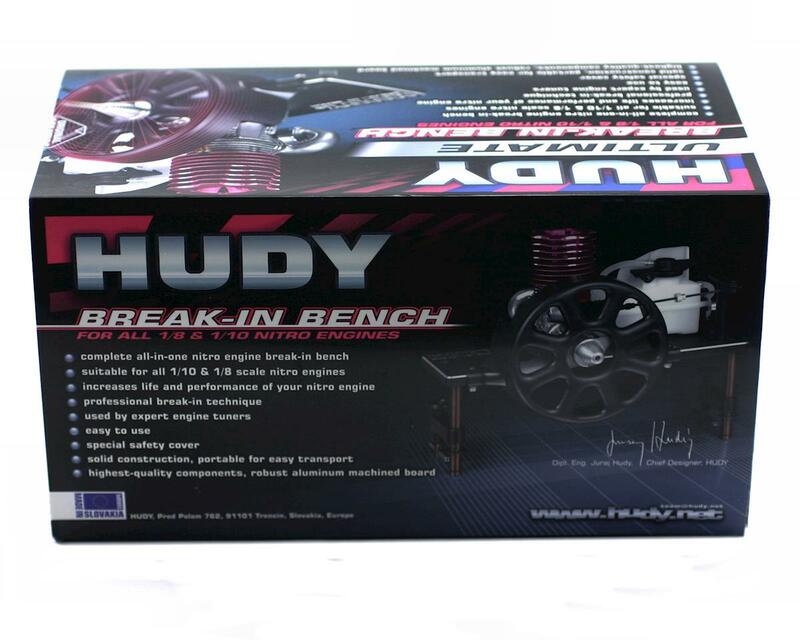 Hudy break in bench is a great product and high quality materials.Very simple to use, and perfect for break in new nitro engine. this is a good tool overall, although i have come across a few problems, you cant run the prop on some motors as it hits the carb, especially if you run a removable venturi. this also means you can not use an air filter whilst the prop is on, also the plastic pole that holds the throttle linkage on split down the middle and broke, i decided not to use the prop to break the engines in and just fitted the clutch as i believed the prop actually didnt let the engines get hot enough. Hudy you need a medal! if you break in 2 nitro car engines in your life its worth buying this bench!! just get (onroad) manifold,pipe,crankshaft locking tool,fuel,glowdriver and i suggest a good 12v rotory airplane starter (you dont need this but it helps! as the included drill atachment WILL struggle on most rechargable drills) and you will be pleased you did! Amainhobbies needs a big pat on the back for having this item!! as its paid for itself 4 times over and runs in engines better than putting them in cars!!! If you are a nitro head like myself this is a must have. I made a little wood stand to hold mine and have routes for the exhaust to flow away from the stand. It stays super clean and it makes break in a breeze. I bash race kits (Losi nitro truggy and buggy) It is a great tool to ensure a long life for those pricey modified or race engines.